I have been a car Collector for 35 years, first time selling 60 of my 70 classic cars. gccc.us ~~This car has been in the same family since it was purchased new. Original dealer sales info and service records ,owner's manual as well as documentation from original owner of ACTUAL LOW MILES TO BE ACCURATE! Paint & Body - The body is in very good condition and the wonderful color combination of the bright silver exterior and original red interior truly highlights this fine rare automobile. This Jaguar performs as it should and looks fantastic, and with its fitted chrome wire wheels this car turns heads everywhere. Excellent damage free body has had one high quality repaint in the original attractive bright silver color; the paint has excellent gloss and depth. The top has been replaced and upgraded to a high quality black cloth. The chrome is in good condition showing only slight wear. Interior - A very nice interior that?? ?s completely original with red leather seats that have been well maintained. The unique red compliments the silver exterior very nicely. This is one of the best color combinations and ads to the elegance of the V12?? ?s appearance. The dash is in excellent condition with all the gauges and functions working normal. While the seats have somewhat faded over the past 1 years, they still look to good to replace. (They are only original once) and still look very smart., Engine & Engine Compartment - The two carburetors have been rebuilt, the cam covers have been resealed and a major tune-up was performed to insure the engine runs wonderfully and pulls hard and strong all the way through the RPM range. The clutch engages smoothly and the transmission is a pleasure to shift. This one runs, drives and sounds, as it should. Car retains all its factory air conditioning but will need will need a Freon charge if you are going to utilize it. This car sounds and drives as only a well-prepared V-12 can. The Bottom Side - As indicated by the photos, this car is original and shows the care that this E has experienced. Clean, accurate, completely original and correct. Driving Impressions - Starts and runs smoothly and the exhaust makes those sounds only a V12 can generate. The clutch engages smoothly and transmission shifts nicely. The suspension is tight and absorbs bumps nicely. This particular Jaguar accelerates quickly as these vintage cars can, with 0-60 times are in the 7 sec range. This is a car that is very easy to drive has excellent brakes that stop it true and straight. The V12?? ?s longer wheelbase gives a great ride quality and allows a longer door that makes entering and exiting the car much easier. Easy to drive around town, but really comes into its own on long tours where the power and torque can be fully explored. Summation - This is a wonderful E-type Series III OTS 4 speed. Only 6119 lhd V12 E-Type convertibles were ever built and a large number of those cars were fitted with the pleasure robbing automatic transmission. The Series III E-Types are undervalued and have just now started to take off in the market. Finding cars that have been well taken of thru their entire life and are equipped with the best options are the key to maximum enjoyment and future value. V12 cars always have had an allure and engine sound that guaranties future desirability. ?? ?OPTIONAL EQUIPMENT . Factory 4 Speed .Factory Air Condition ?? ?tools ?? ?jack ?? 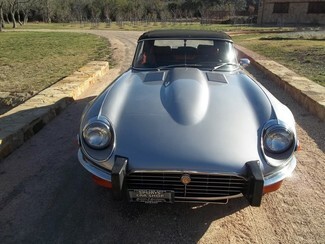 ?spare tire ~~The Jaguar XKE belongs to the Series III of Jaguar. The Series III is much like the Series II except that it is has wider arches over the wheels and a larger radiator opening that improves the cooling. It is manufactured by Jaguar Cars Limited that is now owned by Ford Motor Company. The Jaguar E type, which is also known as XK-E is a road-going sports car that was envisioned in 1956 and replaced the D-type. It was unveiled to the world in 1961 at the Geneva Motor show. The Jaguar XKE design was the brainstorm of aerodynamic engineer, Malcolm Saver. The Jaguar XKE series III is powered to life by a 5.3 liter V12 engine. The 12 cylinder engine is located in the front and has normal aspiration. The car is a rear wheel drive. The engine churns 245 horsepower at 4750 rpm and a torque of 285 feet/lbs. at 3500 rpm. The car has a compression ratio of 7.8 to 1. The Jaguar XKE is equipped with 4-speed gear manual transmission. This 2-door sports car has a seating capacity of 2 people. The braking system consists of disc brakes in the rear and in the front. The car comes with a rack and pinion steering and has a wheelbase of 105.001 inches. The last E-type Jaguar rolled out of the production line in 1975 and was succeeded by the XJ-S series, which was comparatively heavier and larger.